A large US delegation stormed out of a United Nations Commission on Narcotic Drugs meeting on Thursday in Vienna just as Venezuelan foreign minister Jorge Arreaza began an address to the chamber. The US said its representatives walked out together in order to protest the legitimacy of officials representing the Maduro government. The official Twitter account of the the U.S. Mission to International Organizations in Vienna announced the walk-out and posted a video of the protest which occurred during what it called "the world's most important drug control forum." 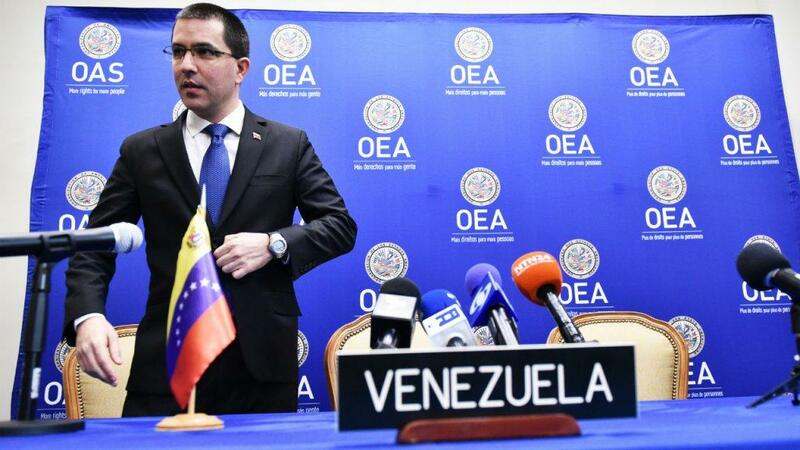 The US-UN Mission to Vienna said in its statement: "Today the United States walked out of the plenary chamber as Nicolas Maduro’s illegitimate representative Jorge Arreaza addressed member states at UN meetings in Vienna - Arreaza does not speak on behalf of the Venezuelan people." The wave of officials exiting the room in a steady stream lasting a minute or more appeared large given that it included international allies of the United States who recognize opposition leader Juan Guaido as true "interim president" of Venezuela. Dozens of officials from Latin America, as well as the US, Canada and some European countries, including France, left the room in protest as Arreaza took the podium for the meeting of the Commission on Narcotic Drugs (CND) in Vienna. Meanwhile journalist Anya Parampil noted that the stunt (though not the first) comes after what appears a US attempt to mount what was ultimately a failed coup in Caracas. Parampil wrote of the incident: "The US tried to undercut Venezuela's FM while he addresses UN member states in Vienna," and concluded, "It's comical that the US would grandstand at the UN in this manner while blatantly violating the international body's founding principles (sovereignty & self determination). What children." And on the same day Russian FM Sergei Lavrov reaffirmed Moscow's support for Venezuelan President Nicolas Maduro, saying "our position is unwavering" in recognizing him as the sole democratically elected and internationally recognized leader of the country. Over the past year Washington has ramped up accusations against Venezuelan military and civilian officials for drug trafficking and money laundering related to narcotics as much of the rest of the socialist-run country starves. Also on Thursday, a new message from the administration, via Secretary of State Mike Pompeo. The US Treasury has in recent months added to a growing list of Venezuelan officials it says are running the "regime's corrupt financial networks" with ties to international drug trafficking and terrorist organizations.